There are so many ways to know about the fan, I mean ceiling fans, but let’s say that, over many years what we have encountered is that our ceiling fan keeps on troubling every now and then it we never learnt from our experiences about how to fix them. Here in the article we have come up with some very frequently asked and appearing troubleshooting problem in the ceiling fan and most commonly how to identify them. One of the common reasons because of which you have a ceiling fan that won’t spin is a blown motor capacitor. The motor capacitor may simply burn out due to either overheating or age. If you have been using the fan for a long time, then the chances of this may increase. The only solution for this is to replace the motor capacitor either yourself or by contacting a professional. In order to check the capacitor, you must first remove the motor housing. The capacitor is basically a little black box which is connected to the pull cord. You will be able to detect the blown capacitor just by looking at it as it will seem melted or burnt. Though rare, one of the causes of a ceiling fan that won’t spin is a broken flywheel. In some of the models of ceiling fans, the blades are attached with a rubber flywheel rather than the motor itself. Due to constant usage and over a period of time, the flywheel may become weak and brittle. This may cause it to break. In such a situation, the motor would still be working or running but the blades may not be spinning. The solution in this case is replacement of the flywheel. This should be done through a professional. Another common reason for a ceiling fan that won’t spin is frozen bearings. 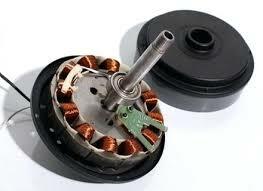 The bearings present inside the motor may have got stuck or frozen which may thus not be allowing the blades to spin. Even if you push the blades by hand, they won’t move if this is the cause or case. It is true that bearings can be replaced but it is recommended to change or replace the fan altogether for better results. Sometimes power failure or problem with the power button could be the reason for a ceiling fan that won’t spill. Thus you must make sure the fan is receiving power to function. You can either use a multi meter to check for continuity or call an electrician to help you check the power. Now that you know the various reasons and solutions for a ceiling fan that won’t spin, you can solve the issue on your own. But if you have no previous experience with electrical wires or connections, then it is better to take help of a professional. Knowing about the problems and solutions is not important, you should even know how to execute them well, as you are not a professional technician if you remember, so stay safe and call the professionals if required in the further sessions. As you already know about the problems and the solutions even.